♣SUPERIOR MATERIAL: The fork tip is made of FDA approved 304 stainless steel which is totally safe as food cookware. And the telescopic pole is made of strong stainless material which could hold the food steadily. The comfortable rubber handle with finger indents protects your hands by giving a firm, steady grip. And it also does well in heat insulation. 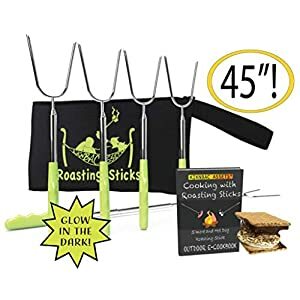 ♣KIDS-SAFE LENGTH: The longest length of this roasting stick is 45″ helps keep you and your kids at a safe distance from the fire. And the rubber handle also protects your hand from heat and reduce the pressure from foods weight. ♣CONVENIENT TO USE: Size is mini enough as a BBQ fork with shortest length of 11.8″. 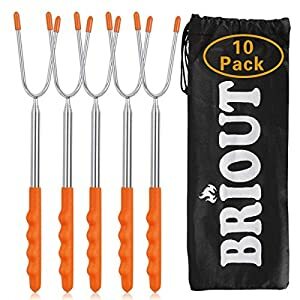 It could be easily cleaned and put back in the matching storage bag, which is portable for outdoor campfire, bonfire, fire pit, barbecue grill. And it’s small and convenient for kitchen storage. SMILES ALL AROUND – Perfect GIFT no more fighting over who gets the glow in the dark smores sticks! 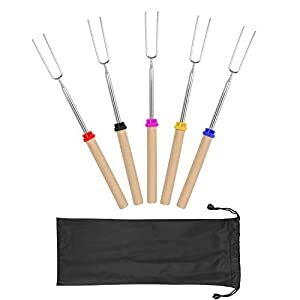 ✔MATERIAL: Telescoping fork set are made from Non-Toxic Heat-Treated FDA Approved Stainless Steel, The comfortable wooden handle gives you a firm, steady grip. Rotating fork axle at a flick of your fingers prevent marshmallow, hot dogs, and sausages from uneven cooking. ✔EASY CLEANING& STORAGE: Our telescoping marshmallow sticks come with a free beautiful canvas bag, so you can easily take it with your campfire and camping cooking equipment. Cleaning the roasting sticks is very easy! You just need to put the tips in a glass of water for about 15 minutes. ✔SAFE FOR KIDS: Experts recommend our 32 inch rotating and telescoping forks, 32 Inch’s of length means you can roast form a safe distance, you can ensure that your child is always at a safe distance from fire.